Who needs donuts? We do and Sam’s got them! Home » what's cookin » Who needs donuts? We do and Sam’s got them! There are lots of new and old gizmos for making this food. Like the donut make where you can see little round wisps’ of dough floating peacefully on a river of hot oil flipping over mid stream and ending up in a plate full of powdered sugar or chocolate or just O’natural. Decorate them as you like or take the ones made for you. 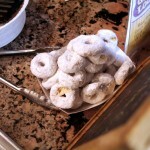 Nothing is more delicious as one of these hot powdered sugar donuts right out of the gizmo.